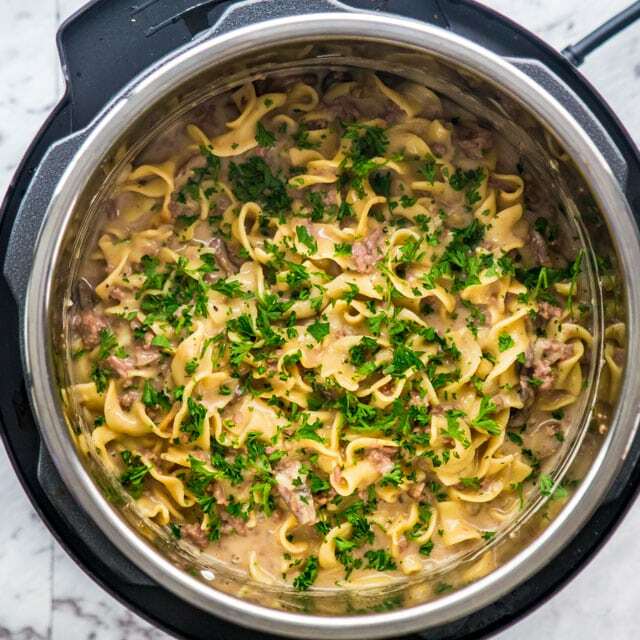 This Instant Pot Beef Stroganoff is about as easy and fast as it gets when making a comforting weeknight dinner without compromising on flavor. 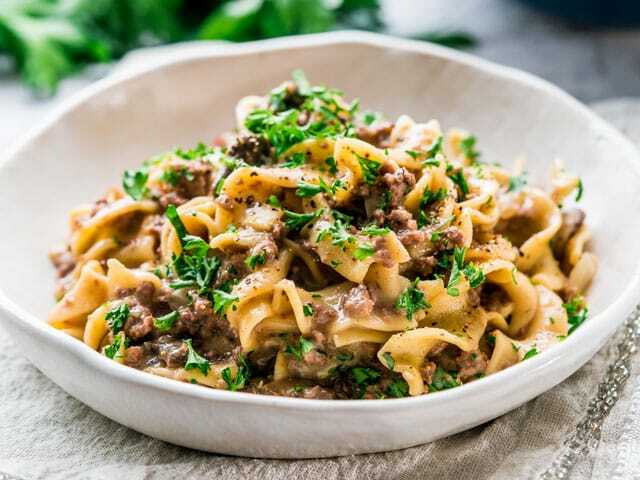 Beef Stroganoff is a classic Russian dish of sautéed beef and mushrooms in a sauce with sour cream and usually served over noodles. This dish has become popular all over the world and there are many variations of it. 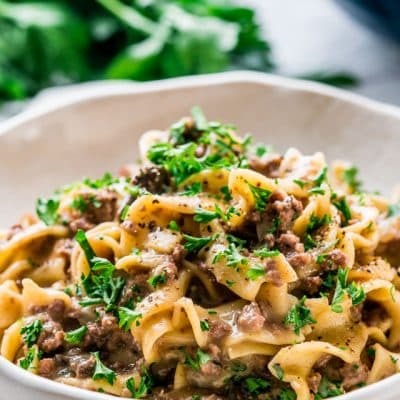 For my version here I’m using ground beef with lots of mushrooms, all made in an Instant Pot and all under 30 minutes. This is the ideal dish that’s perfect for a busy weeknight but still want a good homemade meal in very little time. 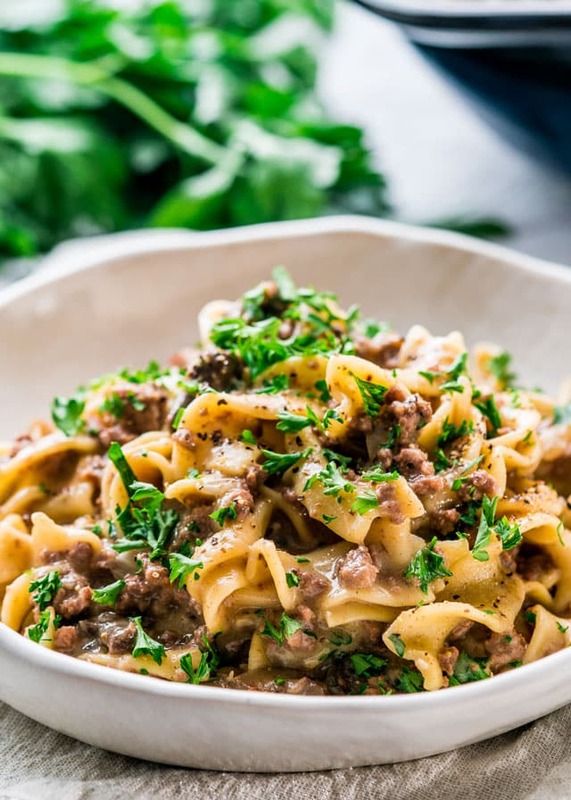 I hope you love this beef stroganoff because it’s super easy to make, loaded with flavors, satisfying and super delicious. Add the butter and olive oil to the instant pot and cook and until the butter has melted. Add the ground beef and break it up with a wooden spoon. Cook the beef for about 3 minutes or until the meat is no longer pink. Add the onion, garlic and mushrooms and stir. Season with salt and pepper to your taste. Add the paprika, white wine and flour and stir well. Add the egg noodles to the Instant Pot, and cover them with the beef broth. Close the lid (follow the manufacturer's guide for instructions on how to close the instant pot lid). Cook on high pressure (Manual setting) for 3 minutes. Stir in the sour cream and taste for seasoning. Adjust with salt or pepper if necessary. Garnish with fresh parsley and serve. If you're not using an extra lean ground beef, you can omit the olive oil. Feel free to substitute the white wine with more beef broth. I would like to try and double this recipe … Would that work in a 6 quart? If not, I could probably do an extra half a recipe. Would I need to increase the cooking time? Thanks! Love this recipe, am trying to make extra to freeze! We use a 6qt IP, so this recipe will be perfect for you! Yummy! I love that I didn’t have to use cream of mushroom soup. I didn’t have beef broth so used a combo of chicken and vegetable broth. I used baby portobellos which deepened the flavor so the beef broth wasn’t missed that much. Definitely a keeper recipe! 10 min natural release was too long- noodles were almost mushy. Good flavor so will try again with 5 min NR. I really loved this recipe for the stroganoff . Excellent. Super yummy. I will make again. Multiply everything by 8 for slightly less than 50 or by 9 for slightly more than 50. Multiply by 8.33 if you want it to be exact! My VERY first Instant Pot meal and it was a success! 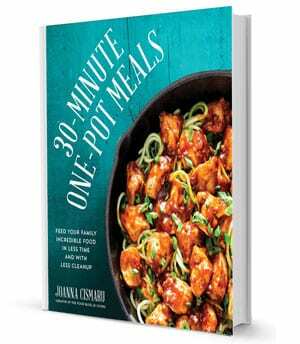 The only thing I changed was the pasta time; I reduced it to 2 minutes instead of 3 minutes. 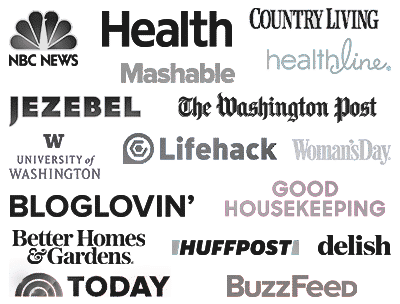 Everything else I followed to a ‘T’. Excellent! I added a little extra garlic, some garlic salt and garlic peppet (in place of regular salt and pepper), a pinch of onion powder and 1 tsp Dijon mustard. Used Greek yogurt in place of sour cream. The timing was perfect for the noodles. Very good. Maybe release pressure at little sooner to get firmer noddles. Can this recipe be used in the 3 quart size instant pot? You might have to cut the recipe to 3/4 just to make sure it doesn’t get over filled. I made this tonight and it was FANTASTIC! I added some Montreal steak seasoning and another BBQ rub my husband likes to the hamburger when it was browning but other than that followed the recipe. So good! My husband cooked this last Sunday and it was very good. I would leave the paprika out. I would have gave a 5 star rating, but I had to add an additional 1.5 cups of water to get liquid to cover the noodles. After doing that, I added extra seasonings because I didn’t want the water to dilute the flavor. Otherwise, My husband and I loved it. The problem is most likely the type of egg noodles used, as we didn’t have any issue with 2.5 C of liquid. Glad it ended up being a hit! I prepared this recipe but substituted cooked meatballs for the beef. Set for two minutes. I had problems with the liquid wanting to burn on the bottom of the “Instant Pot”. I used 2 cups of beef broth & about a half cup of red wine. Any suggestions on preventing the burn problem? Not being able to pressure cook much wasn’t a problem as the meat was already cooked. The stroganoff was delicious. Interesting because there should be plenty of liquid in there so you shouldn’t be getting the burn problem. I assume you got the message on the IP? Usually that just means it needs more liquid. Maybe it’s best to refer to the manual and see what it says.